Hi everyone! I love make treat boxes for my kids friends and teachers. The new Candy Corn Treat Box is so cute and is the perfect size. the Carta Bella - Happy Haunting Collection. I embellished the box with a small rosette and used one of the stickers from the collection for my sentiment. I love how these papers give the box a more elegant look which would make this great for an adult. You could make it more playful and cute by selecting a more whimsical paper. 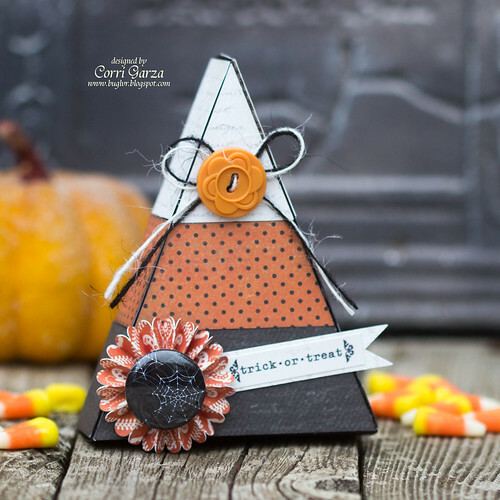 Head over to Lori Whitlock's blog for more inspiration using all her fabulous cut files.